When Governor Snyder set out to “reform” Michigan’s tax structure, he repeatedly said “let’s stop picking winners and losers, let’s start being fair.” Snyder’s fairness did not extend to right-to-work legislation though. Police and firefighters are exempt from the new law (Act 349 of 2012) and still must “share fairly in the financial support of (their) labor organization.” Needless to say, when one group is the declared the loser, they aren’t real happy. 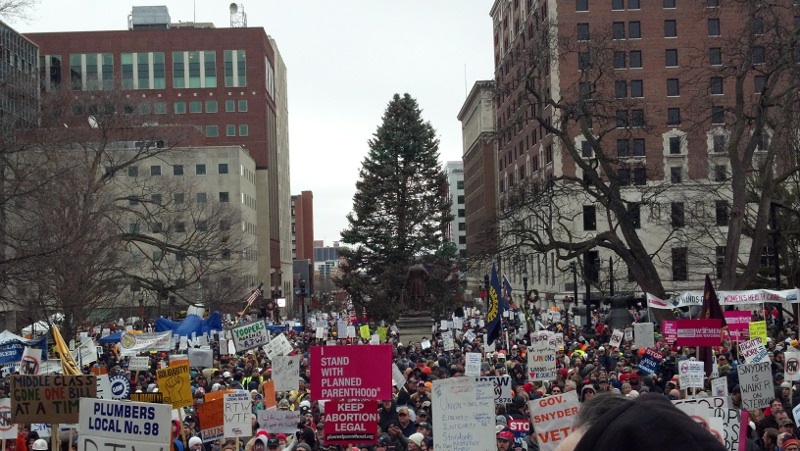 That unhappiness was on display at the Capitol Tuesday as 13,000 people showed up to express their displeasure with the right-to-work law. View from the Capitol Steps. The Romney Building is on the right. The protest was relatively uneventful thanks to the self-control of protesters and the police alike. There was one instance that nearly changed all that though. 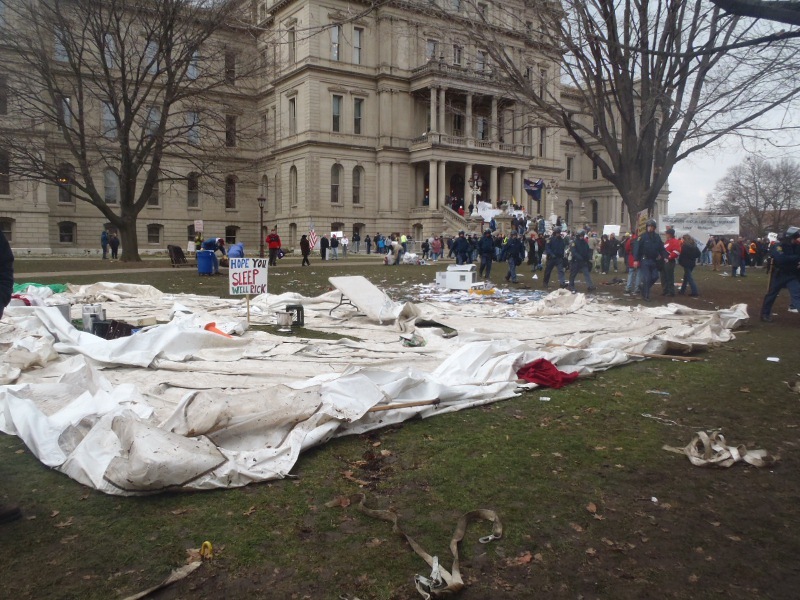 In the early afternoon, protesters began to flank the front and side of the Romney Building where Governor Snyder works. 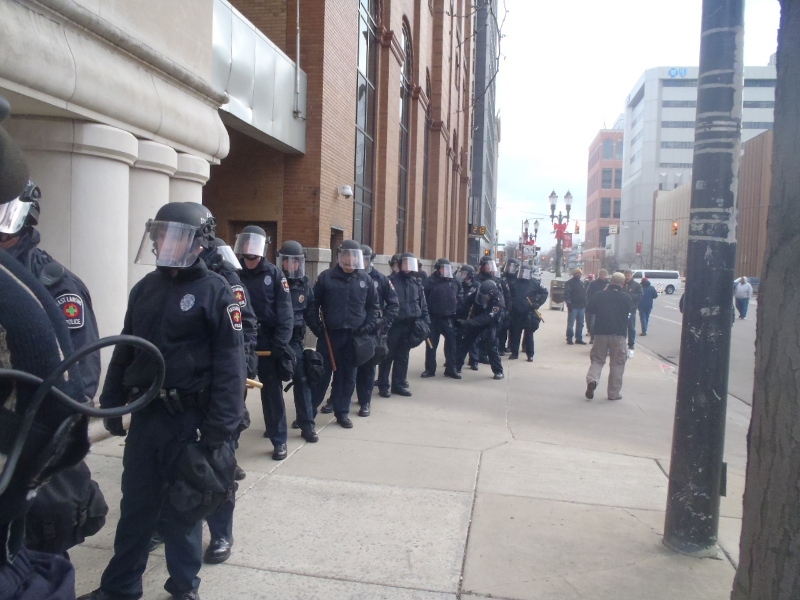 In response to the crowd gathering in that area, the Lansing City Police began to flank the building to protect the occupants. Lansing Police Move to Flank the Romney Building. 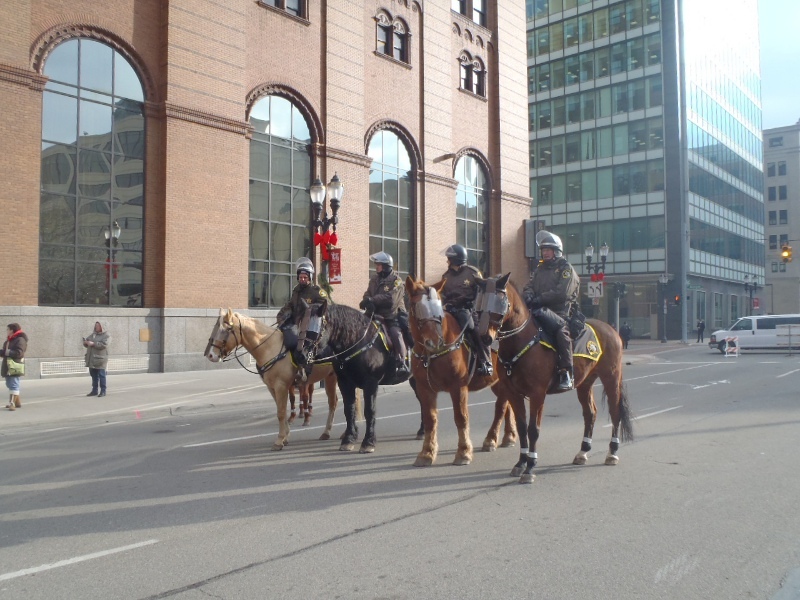 Around the same time four mounted Ingham County Sheriff”s Officers began clearing Capitol Avenue, the street that runs between the State Capitol and the Romney Building. Ingham County Mounted Officers prepare to clear Capitol Ave.
Capitol Avenue was already closed to traffic to accommodate protesters and pedestrians. Clearing the road effectively caused some people to be pushed closer to the Romney Building while others were pushed to the sidewalk opposite the building. The move agitated people who were assembling peacefully on the road. What happened next was clearly a major tactical mistake by someone in a leadership position at the Michigan State Police. State Police Troopers lined up at the end of the road and began marching down the road shoulder to shoulder in a single line reminiscent of a Civil War battle formation. The Troopers, with riot gear on, pulsated their billy clubs back and forth. As the the State Troopers moved forward, protesters simply walked behind them as they passed. In a few moments, the Troopers were half way down the road and found themselves surrounded by angry protesters on all sides. At this point, the troopers were in no position to protect themselves, let alone the Romney Building. Protesters chanted “shame on you, your union too” while others yelled “you’re next.” Some protesters tried to calm people by explaining that the Troopers were just doing their jobs and had no say in the legislation that exempted them from the right-to-work laws. A Sargent looking on was unwilling to say who ordered such a tactical move, only specifying “someone above me.” After a few tense minutes, the troopers moved to help flank the Romney Building. Only one person was arrested on the road during that particular incident. An ugly, and perhaps deadly, situation was thankfully avoided. The State Police are Surrounded. While picking winners and losers may be a risky proposition when it comes to tax breaks, it could be a deadly proposition when it pits groups of people against each other. It was disheartening to see honest hard working Michiganders with so much in common put in such a confrontational position. Tuesday was a sad day, not only labor relations, but for human relations. 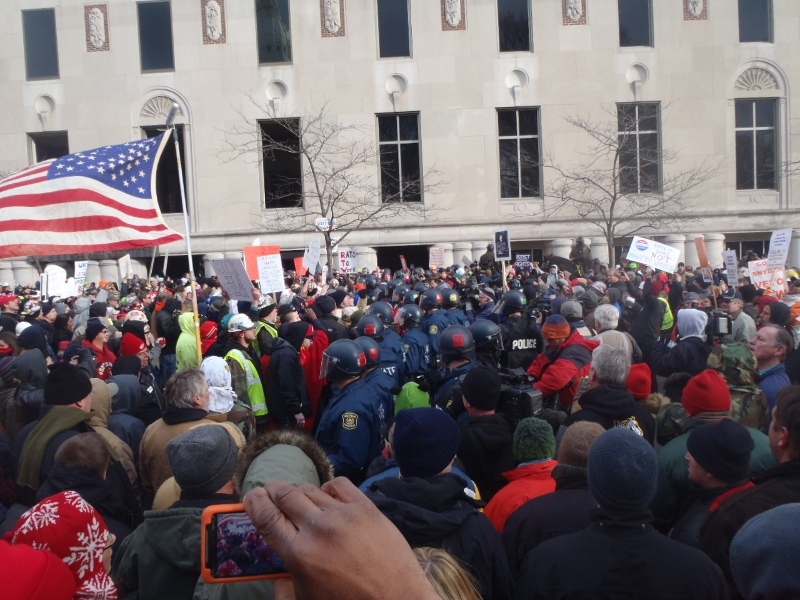 It was just the beginning of the turmoil that right-to-work will create in Michigan for years to come. This entry was posted in Right-to-Work. Bookmark the permalink.